Chrístõ smiled to see how excited Julia was. He was relieved to see her enthusiasm for this trip. It was the first time she had been on a large space ship since the SS Aldous Huxley, and he didn’t want her to go over sad memories. 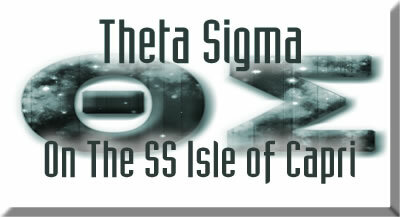 Then again, the SS Isle of Capri wasn’t anything like the SS Aldous Huxley. It wasn’t like ANY space ship even he had seen before. He was a little bit excited himself about being here. He’d heard a lot about its unique facilities, the almost decadent luxury afforded by this flagship of the Diplomatic Space Fleet to Ambassadors, Presidents and Crowned Heads of State who attended conferences and functions aboard it. He felt her touch his hand as they rode on the anti-grav corridor. Such was the luxury that they hadn’t WALKED under their own effort since they stepped aboard. Ahead of them was the steward responsible for their comfort. Their luggage moved along beside him on its own anti-grav pads, steered by a control on his right arm. Julia studied the neatly brushed, lilac furred tail looped over the same arm to keep it from dragging on the floor. All of the staff, male and female, from the security officers in their deep purple and beige uniforms to the cleaning staff who made themselves scarce when any of the guests entered a corridor, were of the same basically humanoid species with those beautiful tails. They were called Vulpesi and came from a species that evolved from a wolf like creature. Whatever their work, whatever uniform they wore, a neatly brushed tail was a matter of pride to them. A few years ago, Julia thought, when she was a little girl, she might have been tempted to stroke their tails. But she was nearly fourteen, and she was Bonded to an Ambassador of the Gallifreyan Diplomatic Corps. That sort of thing wasn’t proper behaviour. She gave a little sigh. Stroking the tails of diplomatic employees was not something she missed being able to do, but she HAD lost a lot of her childhood years. When she was fighting for her life on the SS Aldous Huxley there was no time for play. And even though Chrístõ had made sure she had plenty of fun, a lot of the things that happened when she had travelled with him were unusual for a teenage girl to experience. And as much as she LOVED being his partner at diplomatic functions, as much as she adored the grown up dresses she got to wear, and being able to dance till after midnight with him, there WAS a downside. Mostly the other guests were older, married women, wives of diplomats, or their grown up daughters who wanted her out of the way so they could size Chrístõ up as marriageable material. She didn’t have many people she could talk to. Living in a grown up world when she was only thirteen going on fourteen could be difficult. Chrístõ felt her thoughts, and understood them. And hoped he could do something about it. Cirena kissed Julia fondly. Chrístõ and Penne embraced like brothers – which they officially were since Penne invested Chrístõ as Crown Prince of his Empire. Cirena watched as the steward asked Julia to put her hand on the special key that opened the door to her suite. It was imprinted with her DNA code and made the room fully private to her until the end of her stay. “Chrístõ, does this suite have a maid’s sideroom?” Cirena asked. “Yes, ma’am,” the young woman said and curtseyed to her Queen. Julia looked surprised but not displeased by that idea. Nor did she mind when Cirena said she would love to chat with her while Selma unpacked her luggage. Neither Penne nor Chrístõ seemed to have any say in the matter. Penne said that they would all have lunch in their royal suite in an hour. Cirena promised to bring Julia along. Penne went with Chrístõ to the next door along the corridor where The Steward asked Chrístõ to imprint his own key and they stepped into his suite. Julia was enraptured by her suite. That was the only word for it. She ran across the simulated purple grass to the simulated lake that reflected a purple sky dotted with pale mauve clouds. Very realistic animatronic swans swam across the water making ripples in the calm, glassy surface and causing the water to lap against the edge where she knelt. She put her hand in it. Nearest to her, it WAS real water, but there was NOT a lake nearly a quarter of a mile wide in this room. Most of it was a wonderful optical illusion, as was the ‘sky’ above her that lit the room with soft, diffused light and made it feel as if she was really outdoors by a summer lake – on a planet where purple was the prominent colour. She looked at the swan shaped ‘boat’ that rocked on the water’s edge. It was actually her bed and she dived joyfully onto it. The cover was made of simulated swan feathers and was the softest, warmest thing she had ever wrapped herself up in. But she didn’t stay on the bed for long, because there was something else in this room that attracted her. Cirena and Selma both watched as Julia went into the concealed room between two simulated trees and came out dressed in a ‘swan’ costume from the Swan Lake ballet this room was themed on. She went to the practice bar with a mirror that reflected all the splendour of the room and warmed up before performing one of the more vigorous set dances of that ballet. Cirena and Selma applauded when she was done and they all returned to the ‘lakeside’. The purple grass was as comfortable as an armchair, and they sat together. “When Chrístõ and I are married, I think we shall stay in a room like that,” Julia said. “Yes, I understand,” Cirena assured her. “Very impressive,” Penne said as he looked around Chrístõ’s room. It was a very large oblong, with the purple and beige walls lined with columns in the style called Doric on Earth. They gave the impression of being the outer peristyle of a Greek temple, but there was no inner curtain wall to it, and no altar for worshipping any gods. There were more Doric pillars supporting huge urns overflowing with sweet scented flowers and two long, low couches, with a cornucopia of fruit on a pedestal beside each one. Aside from that furniture, there was a large expanse of clean, smooth floor where meditation or martial arts practice might be done. Chrístõ had requested that such an area might be incorporated into the customisation of the room. All of the columns, every vase, even the meditation floor, were adorned with the two Greek letters, TS. When he looked up, the domed roof, like a night sky with moons and stars, had a constellation right at the zenith in the pattern of those two letters - TS. “I think the second interpretation fits you better,” Penne assured him. They both tasted some of the fruit from the cornucopia. Of course it was of the best quality and tasted delicious. But Penne seemed to have something else on his mind. “We were rather surprised to see you and Julia aboard the Isle of Capri, you know,” he said. “What do you mean?” Chrístõ asked. At that moment, however, he discovered exactly what reputation the ship had. There was a low swooshing sound and two youths materialised between the pillars at the far end of the suite. They were of the same species, the Vulpesi, as the ship’s more conventional staff, with their long, luxurious, lilac tails curled around their arms. But these two were dressed in absolutely nothing except some judiciously placed scraps of soft leather. They declared that they were there, as ordered, for His Excellency’s entertainment. It took Chrístõ a moment or two to remember that ‘His Excellency’ was his own title. Kohb used to remind him of it, but since he left his service he did tend to forget. Chrístõ’s pale complexion blushed deep red then paled to alabaster as the proverbial penny dropped and he tried not to associate the word ‘equipped’ with those small leather garments. Penne had a perfectly straight face outwardly, but his laughter was transmitting to Chrístõ telepathically and wasn’t helping. The youths turned and left. Chrístõ looked at Penne, who had now abandoned any pretence of dignity and was laughing out loud. “YOU set this up!” Chrístõ declared to him. “This is your idea of a joke on me, to see what I would say to those… those…” He knew several words for what they were, but his polite upbringing did not permit him to use them. “Is there one of those in Julia’s room?” Chrístõ asked. Then he didn’t wait for the answer. He ran out of the room and straight along the corridor outside, ignoring the anti-grav cushions. He knocked urgently at the beige and purple door of Julia’s room. Selma let him in. He, and Penne, close behind him, stepped into the beautiful room with the swan theme. Julia and Cirena were dancing together. The two men watched in admiration of their women for a moment before Chrístõ adjusted his sonic screwdriver and scanned the room. He found the transmat portal and used the screwdriver to put a deadlock seal on it. It could stay that way until they left the ship. Julia had stopped dancing, wondering what he was doing. Penne smiled at her. Julia smiled. So did Cirena. Penne took Chrístõ by the shoulder and brought him out of the Swan Lake suite. “They’ll probably bill you for damaging the transmat,” he told him as they stepped onto the anti-grav floor and headed towards the lift shaft. Chrístõ noticed an unusual cadence in his voice as he said those last two sentences. He looked at Penne and caught the shine in his eyes. The lift opened and two young women in the livery of the Diplomatic Fleet security staff stepped out. They gave Penne and Chrístõ an odd look, but as they were guests it was not their place to interfere. If two well-dressed men hugged in the public corridors in a way usually reserved for the bedroom suites, that was their business. Chrístõ and Penne both laughed joyfully and stepped into the lift shaft. That was something of an act of faith in the system that was used aboard the SS Isle of Capri, because they effectively stepped onto nothing. If they looked down, all they could see was the lift shaft, lit at each floor by a soft purple light. But they were prevented from falling by anti-grav pads that bore them up to the top floor of the magnificent ship. The observation deck was designed on the theme of the observation deck of the Eiffel tower on Earth, although what looked like wrought iron and glass windows were actually titanium and exo-glass. These automatically shielded the observers from the dangerous ultra-violet rays and other dangers from the supernova the ship was in close proximity to. It was a spectacular sight, chosen by the host of the grand ball later in the day, a man who loved spectacle of all kinds – hence his choice of the SS Isle of Capri for his grand birthday celebration. Corwen was there. Penne smiled joyfully as he watched the spectacle with his biological son and his adopted brother. Despite the fact that he was all of that, and Penne’s double, too, the boy was diffident towards Chrístõ at first. He found it hard to know how to deal with that trait in his son. Shyness didn’t quite go with his position as a prince of a seven planet Empire. And he was very much the opposite of his father, for whom shy didn’t even go into the same sentence. Of course, he had not had very much time to learn about being a prince, yet. The circumstances of his short life were hardly best to fit him for that role. But Penne was determined to help him get over ALL his problems. Chrístõ watched as father and son held a rapid telepathic conversation. He could feel it going on, but he was not party to what was, of course, private between the two of them. “Of course!” Chrístõ noted the paternal pride in Penne’s voice and almost envied him. But there WAS plenty of time for him to be a parent, when the time was right. Meanwhile, he was happy for them both. He walked with them around the observation deck. He found that Corwen was interested in the supernova and space generally. Chrístõ found himself talking to him about surfing solar winds in his TARDIS. The boy was fascinated by the idea and Chrístõ promised he would take him on a trip some time. That broke the ice with him and he seemed to talk much more easily after that. The hour before lunch in the royal suite went by quickly. And royal was an apt word for it. It was much bigger than the two single suites that Chrístõ obtained for himself and Julia. There were a large number of ladies and courtiers to be accommodated as well as the four members of the Adano-Ambradan Royal Family. And it was, as Penne said, designed on the theme of a Roman spa. A large part of the huge floor was taken up by the hot, tepid and cold baths and the associated steam room and sauna facilities. All of the baths were huge, the tepid one being as big as a good twenty-five metre public swimming pool. Tiles in various shades of purple were arranged in mosaics on the pool floors depicting classical figures like Neptune, the Roman god of the sea, and mermaid figures and mythical sea creatures. The master bedroom for the King and Queen and those for the Prince and Princess and their entourage were concealed behind optical illusions of Roman pillars, as was often the case on the SS Isle of Capri. The dining room, though, was right beside the baths, a great table of polished oak set with dishes that continued the Roman theme in their decoration and the opulence of the meal itself. The Royal family of Adano-Ambrado, along with Chrístõ and Julia as their honoured guests, sat to lunch together, along with their entourage of Courtiers and Ladies, CPOs and secretaries. They were all served by lilac tailed waiters and waitresses in crisp linen, all part of the service – all part of the USUAL service, Chrístõ noted – provided by the Diplomatic Fleet. They all enjoyed their meal and considered how they might spend the afternoon, since the grand birthday ball didn’t begin until the evening. Among the amenities of the ship there was a huge casino on the mezzanine floor, styled on the gambling palaces of Pasra-Holix in the Delos sector. But even if Julia was not with him, Chrístõ would not have been interested in that, and Penne was not inclined towards such diversions, either. Then there was a grand theatre and an opera house, but neither Shakespeare’s Macbeth, performed in Calliric Latin nor a five hour CONDENSED version of a three day long Priminian High Opera met with much interest. Chrístõ was just glad to hear Julia use the word ‘play’. Penne wanted Corwen to play, too. But before he could, while they were changing into their bathing costumes, he had to receive one of his treatments. The royal physician attended, but it was Penne who took the syringes from a specially sealed box and injected the medicine into his son’s bloodstream. It was clearly painful to the boy, but he trusted his father. And the loving hug from Penne after it was over seemed to be adequate compensation for the discomfort of the treatment. In the pool, Corwen swam vigorously. Julia took to him immediately, and Chrístõ was able to relax in the hot pool with Penne, just like old times. “They look right together, playing. But Julia will still be your young lady tonight at the ball.” Penne sighed happily. Chrístõ knew why. He WAS happy. Corwen had come into his life in an unexpected way, but he had brought joy. “Let’s join the CHILDREN in the other pool then,” Chrístõ suggested. And they grinned at each other and pulled themselves out of the hot pool and dived straight into the bigger, tepid one, where Julia and Corwen were enjoying a game of underwater tag. They joined in. So did Cirena and Nestista and the ladies in waiting, and anyone who might have casually come across them would have had trouble knowing which of them were the Royal family, which their friends, and which their retinue. So the afternoon passed. But then it was time to be dignified and grown up again, for the Royal family of Adano-Ambrado to be Royal and for Chrístõ to be an Ambassador of his people. In his robe of black and silver he proudly walked into the ballroom with Julia dressed in a white gown that matched her Swan Lake themed room. It was silk, but designed to look as if the bodice was soft layered feathers and the skirt a swan’s plumage. She looked beautiful and grown up while, at the same time, still a girl. Of course, she danced with him most of the time, but she also danced with Corwen, and, to her delight, the young Crown prince of Ryemym Ceti also asked her to dance while his teenage bride danced with Corwen. Chrístõ was, again, quite happy to let her be with those young people who were closer to her own age, knowing that she would return to him at the end of the night. Halfway through the night, Penne called Corwen to him. His next medication was due. “We have to go back to the royal suite for it,” Penne said to Chrístõ. “Come along if you want.” Corwen asked if Julia could be with him, too. “She is my friend,” he said. “I am glad of that,” Penne told him. He took his son by the shoulder and they made their way out of the crowded, noisy ballroom, and down in the turbo shaft to the suite level. They stepped out and onto the anti-grav cushions that moved them along the corridor. They were close to the purple and beige double door of the royal suite when Chrístõ noticed something strange. A mist was coming from the air vents along the wall and floor and ceiling level. He detected a smell that he knew at once to be dangerous. He stepped off the anti-grav cushion and pulled Julia into his arms as he stood flat against the smooth wall. He took a deep breath and closed his mouth over hers, sharing his recycled breath with her. He sent a telepathic shout to Penne in the same moment and he did the same with Corwen. “He doesn’t know how to close off his breathing?” Chrístõ asked. “Knock out gas, I think,” Chrístõ answered. He saw out of the corner of his eye one of the security Vulpesi drifting by on an anti-grav pad, unconscious, his glorious tail trailing along behind him. Five minutes was enough. The mist began to clear. He could feel fresh, clean, oxygenated air now. He released Julia from what now qualified as the longest kiss he had ever given her and they both breathed deeply. She was a little dizzy at first, and she was frightened and worried for the others, too. So was Corwen, whose first thought was, like Penne, for Cirena and Nestista, the female members of the family he had come to love. Chrístõ ran to the security guard, who was now travelling back towards them as the anti-grav cushion automatically reversed. He pulled him off onto the solid floor and put him into the recovery position before checking his vital signs. “Yes,” Penne said and reached for his entry key. He opened the doors and they stepped inside. The first thing Chrístõ noticed was Penne’s secretary, face down in the tepid pool. He kicked off his shoes and ran, without a second thought, diving into the water to bring the man to safety. Penne helped to pull him out and Chrístõ began CPR on the poolside. “He’s been in for several minutes,” he said. “But I think… we might be lucky.” He saw Julia and Corwen clinging to each other for comfort as they watched him and heard their gasps of relief as the man breathed for himself and coughed up pool water from his lungs. He was rather startled to discover that the Crown Prince was the one who had saved him. “How come he’s conscious and the others aren’t?” Julia asked. “Chrístõ!” Penne called out. “We’ve been robbed.” He ran across the room to where a door had been forced open on a portable strong box. It contained some of the crown jewels of Adano Ambrado that he and Cirena wore when formally meeting other heads of state. “Over there, sir, by the two largest pillars,” said the secretary as he went to do as Chrístõ had ordered him. Chrístõ examined it with his sonic screwdriver. “Do you ever go anywhere without that?” Penne asked him. “I can HELP,” Julia insisted. They ran to the door of the suite and along the corridor, ignoring the slow, sedate, anti-grav floor. The turbo shaft doors seemed to take an eternity before they opened. They travelled a single floor down and stepped over two more security guards with their tails trailing sadly on the ground. Christo made sure they were safe while Julia got the door to her room open. “Because I locked it from THIS side with a deadlock seal. That should stop it from being jammed from the OTHER side.” He carefully unlocked the seal that he, himself had set. As Julia brought Corwen to sit on the swan bed, he told Penne to stand close to him. He used the sonic screwdriver to operate the transmat from this side. “Chrístõ!” Penne yelled as they found themselves suddenly in a turbo shaft – without the anti-grav floor. They hung for a second or two then began to fall. Chrístõ swore in Low Gallifreyan as he changed his grip on the sonic screwdriver and aimed it at the anti-grav mechanism inside the shaft. He was relieved to find his feet touching the invisible gravity field. Penne shouted out in relief, too, as they descended at a much less distressing speed. They were in the lowest level of the ship, below the engine rooms, below the kitchens, in an area that the majority of the high born guests above would never even know existed. “Waste recycling and disposal,” Chrístõ said as they stepped over huddles of sleeping Vulpesi in work overalls and passed between a series of gurgling tanks. The water from all the ornamental baths, pools, artificial lakes, waterfalls, showers, sinks, and even the lavatories, was broken down into its constituent molecules within them. The hydrogen and oxygen molecules were reformed back into water. The TARDIS created water the same way, but this was a much bigger scale. The other matter was filtered and recycled in various ways, and a very small amount of unusable waste ejected safely in space. “Why is it so cold?” Penne asked, shivering in his silk dress robes that were meant for an ambient ballroom not a cold utility deck. Chrístõ should have been even colder, since he was still damp from his dive into the pool, but he was far more experienced at regulating his body temperature. Penne, who had studied neither, tried and failed to find another response. Any other time he might have managed it, but this apparently unimportant conversation about pipes was getting in the way of finding the medication his son needed. 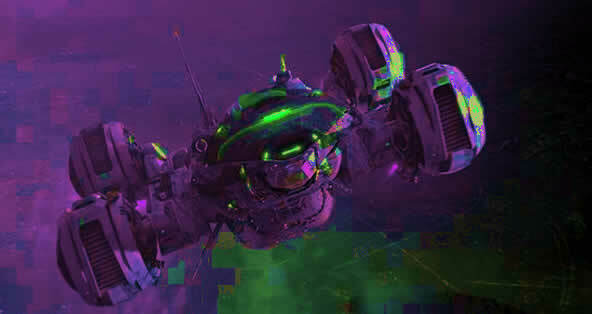 “Never underestimate plumbing,” Chrístõ told him as they moved along the service deck to where the food waste was broken down in more huge vats into a basic vegetable protein. All of the food, be it meat, fish, vegetable or fruit, was synthesised, of course. And nothing actually went to waste as long as it WAS edible. Strange – and a little disturbing - to think that the delicious fruit in the cornucopia, the lunch they had enjoyed, the banquet in the ballroom, all began – and ended - down here in these gurgling vats. Through the next bulkhead door were the recycling plants for all of the other substances used in the day to day running of the ship. And it was here that they discovered more going on than ought to have been. The recycling of the food and water were both automated processes that needed very little supervision. The sorting of glass, metal, plastic, broken china, worn linen, torn curtains, and other discarded rubbish could only done by hand even aboard a luxury ship, and some of the lowest ranks of the staff would do just that every day. Except they weren’t. Chrístõ peered carefully around the bulkhead door and saw just what was on the conveyor belts that ran along in front of the ‘sorters’. He heard the voice of the man ordering the work. He was NOT a Vulpesi. He looked, Chrístõ thought, like one of the Ay'Ydiwons, perhaps a servant of the Matrix whose ball was the reason why so many owners of crowns were gathered here to be robbed. He was reptilian skinned, though basically humanoid. He had a short, stubby tail that his coat was designed to be fitted around and a bald, reptilian head. His forked tongue shot out of his mouth every so often and his eyes looked at the treasures with a greedy, covetous expression. One of the sorters foolishly tried to slip a large ruby into his own pocket and regretted it briefly before he died in the heat of a blast gun. The sorters were not Vulpesi, either. They, too, seemed to be of the Ay'Ydiwon race. But two Vulpesi hovered nearby. They grasped their tails nervously. They were so nervous, in fact, they accidentally grasped each other’s tails at one point and had problems when they tried to move apart. The two Vulpesi argued, demanding payment now. Chrístõ thought that a very bad idea. This did not look like a man who bargained. But he didn’t especially care what happened to them. Treason was the most disgraceful crime he knew. The Vulpesi had no home world as such, although there probably was one their species originated from, somewhere. They served the Diplomatic Fleet as the ultimate neutrals with no political allegiance or favour. And that made the betrayal by these two all the worse. Chrístõ nodded. He looked around thoughtfully. He examined those exposed pipes and conduits that ran across the ceiling of this utility deck. They carried all of that waste that was sent down to be recycled, as well as the recycled product that was sent back up to the ship. The pipes that carried the water had condensation on them. They were still only a fraction above freezing inside. He remembered the first time he had met the Matrix of Ay'Ydiwo. He had been exposed to heat and dehydration and Chrístõ had saved his life by putting him in a cold shower. But their reptilian race were affected by both extremes of temperature. “We’re going to get our feet wet,” he said as he adjusted his sonic screwdriver to laser mode, ignoring Penne’s telepathic comments that he would one day find himself in a situation where that tool wouldn’t help. He aimed at a section of pipe directly over Gerinynxa and the two Vulpesi first. All three screamed in shock as they were deluged with near freezing water. He aimed at several other places and it was better than turning on the sprinklers as water poured down onto the sorters. The effect, especially on Gerinynxa was spectacularly quick. He was moving in slow motion as his reptilian blood cooled and made him torpid and clumsy. He lost his grip on the blast gun in his hand and Chrístõ was surprised when one of the Vulpesi grabbed it and turned it on him. “Don’t shoot him,” Penne cried as he and Chrístõ ran forward. “Give me that gun and the two of you get over there and put your hands on your heads.” Chrístõ grabbed the gun from the startled Vulpesi, who obeyed the order immediately. They both did. He turned the weapon on Gerinynxa. “I don’t… know…” he answered in a slow voice as if he was a mechanical creature that was winding down. Penne and the two Vulpesi ran in search of the precious box. Chrístõ turned and looked at Gerinynxa. Gerinynxa said nothing. He couldn’t. He was so cold his jaw had seized up. But Chrístõ knew something about the justice system of Ay'Ydiwo. Their method of execution was similar to the French guillotine. Except there had been some research that suggested that the slow reptilian brains of the Ay'Ydiwon species lived on for anything up to twenty or thirty minutes after decapitation. It was thought to be an excruciating torture. Chrístõ had been among many in diplomatic circles pressing the Matrix to abolish the death penalty, but so far the Ay'Ydiwon ruler had not given in to that pressure. The look in Gerinynxa’s eyes, the only part of him that still seemed capable of any movement, spoke volumes about his thoughts on the matter. “I’ve found it,” Penne said, holding up the box that was far more important than any of the Adano-Ambradan crown jewels. Penne ran. Chrístõ turned as the two Vulpesi hovered, holding their tails up out of the cold water that came over their shoes. They were beyond nervous now. They knew they had only one option, and that was to co-operate with the one who had so easily defeated the plan they had foolishly involved themselves in. He used Gerinynxa’s own leather belt to secure his hands behind his back. With the water no longer pouring down the room was beginning to get a little bit warmer. Soon it was at least possible for the reptilian bodies to move. But by then they were all secured. Then just as Chrístõ was wondering what to do with his prisoners the bulkhead doors both ends of the recycling room burst open. The uniformed guards of Ay'Ydiwo poured in, led by the Matrix himself. He took in the scene and smiled at Chrístõ. Ay'Ydiwon smiles, all sharp teeth, could be unnerving unless you knew that modern Ay'Ydiwons were vegetarian and, their death penalty apart, perfectly civilised and enlightened people. He turned his face towards Gerinynxa, and forgiveness was not in his thoughts then. He gave a low growl from the back of his throat that was a throwback to when Ay'Ydiwons were neither vegetarian, civilised nor enlightened. Gerinynxa shrank back, nearly frozen in terror and his head bowed in defeat as two Ay’Ydiwon guards took him away. Other guards rounded up the ‘sorters’ and put the two Vulpesi under arrest. “I think they will,” Chrístõ said. He found it as incomprehensible as the Matrix did. Why anyone, of any species would do such a thing. 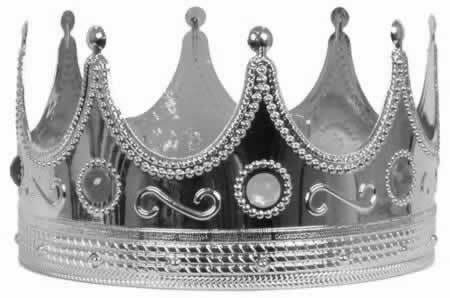 He picked up a crown that had been partially dismantled, the jewels prized out of it. He recognised it as the State Crown of Adano-Ambrado. He had seen Penne wear it on important occasions. The crown was just a piece of shaped metal. The jewels were just pretty stones. Were they worth treason? “I’ll leave this in your hands,” he said to the Matrix. “I need to make sure my friends are all right.” He bowed respectfully and then turned and ran. Without his sonic screwdriver he couldn’t access the transmat back into Julia’s room, but he could take the turbo shaft up to the right floor. Julia answered the door to his knock. She hugged him, joyfully. “Corwen is fine now,” she told him. “He’s had his medicine.” But he could see that. Penne and his son were sitting on the swan bed, holding each other tightly. Chrístõ recalled Penne’s words only a few hours before. His crown had been dismantled. But he still had his son.